The Sun newspaper is, of course, not a newspaper in any real sense of the term, but is rather a printed organ of propaganda that perpetuates the message of the right wing. It achieves this ideological objective by deliberately appealing to the gross ignorance of the working-class. This ignorance is the product of a ruthless bourgeois system that advocates a rigid class system based upon economic and educational privilege. Those who pull the strings behind the Sun newspaper are not from the working-class – on the contrary, they hail firmly from the middle-class. 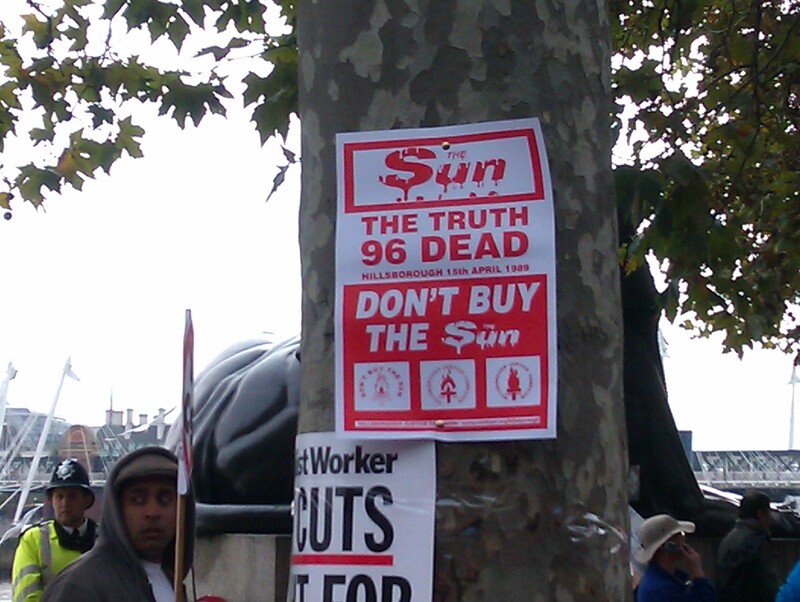 They possess a demeaning attitude toward those that the Sun newspaper is aimed at. They pretend to as if at one with their readership, when in fact they are pursuing a definite and exact covert political agenda. Working-class people can lack understanding because they have been excluded from the higher aspects of the education system, or failed by its schooling. Those who produce the Sun newspaper are very well aware of this. Their object is to extenuate, magnify, extol, and legitimise this state of poor education and create a sub-culture of working-class pride in base ignorance, prejudice, and greed. Those who fall into the trap of accepting the rhetoric of the Sun newspaper often feel, mistakenly, that they are being empowered by seeing what is packaged as ‘their opinion’ splashed across the newspaper every day. Many even read this newspaper with a sense of pride, and have absolutely no idea of the damage the Sun newspaper is doing to the welfare and development of the working-class itself. The middle-class, through the use of the Sun newspaper, turns the working-class against itself. It perpetuates hatred, racism, and envy, encouraging unjust action against blacks and ethnic minorities, as well as migrants, refugees, and asylum seekers. It attacks the NHS and the Welfare State, pouring scorn and criticism upon those who are required to make use of their facilities and benefits. It once described a young woman defending herself against a baton wielding mounted police officer as ‘scum’, and routinely calls for the working-class to attack the very institutions that have been built-up over the years that were designed to assist the balancing of society. The middle-class always envies the upper-class and attempts to mimic them in everyway. The middle-class, although less in number, hates the working-class who make-up the majority of people in British society. If every working-class person voted in the UK, the right wing Conservative Party and the equally Right Wing Liberal Democrat Party, would never be elected. To prevent this situation from manifesting the Sun newspaper exists to convince a significant proportion of the working-class that their best interests lie in middle-class ideals. To aid this mission it is important to those who produce the Sun that the working-class remain poorly educated and never realise the confidence trick that is being perpetuated at their expense. Middle-class ideals, by there very nature, exists to keep the working-class impoverished, downtrodden, and excluded from high paid employment and higher education. The point of this is to keep the working-class from realising the predicament they are in, and organising en mass to do some thing about it. To prevent this organising across society, the Sun newspaper acts as an ideological weapon that creates derision, disharmony, disunity, and resentment throughout the working-class, which encourages a routine anger that is aimed at one another within that class. The working-class can not unite if it is riddled with a right wing ideology that blames the poverty and the suffering experienced as being the product of other members of the working-class, immigrants, dole cheats, Muslims, and any number of other imagined groups declared unsound by the Sun editor. The Working-class is, of course, an international movement that exists beyond any mistaken notions of race. For the Sun newspaper, the concept of race is very important because the middle-class believe that their success in life is not due to the innate inequalities existing within a society, but is rather due to their own hard work. This confirms for them the strict hierarchy that they which to see in British society, with all other races being deemed to be of a lesser biological worth. The Sun newspaper achieves this simply by printing nonsense, fiction, prejudice, and lies on a daily basis. It is bought by the working-class who are effectively giving their money directly to the right wing Conservative Party, who when elected set about dismantling every social institute designed to help the downtrodden, vulnerable, and the oppressed. The Sun newspaper represents at least some of the links in the enslaving chains that Karl Marx advised should be cast off. In this respect the working-class should unite and boycott the Sun newspaper and follow the example of the comrades in Liverpool.